OR TO SCHEDULE A FREE CONSULTATION! 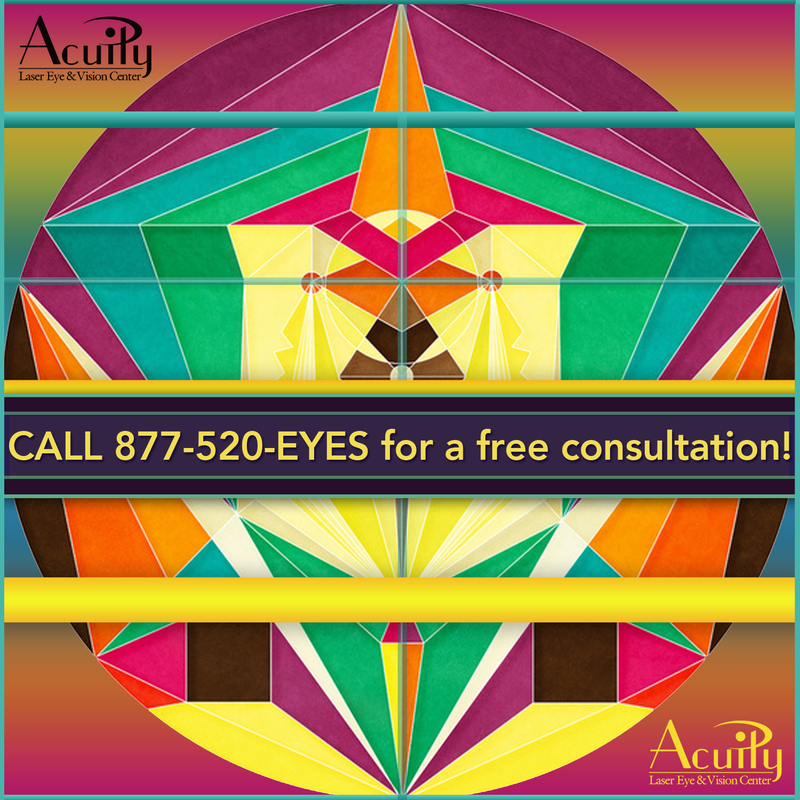 At Acuity we offer a free, no obligation LASIK consultation to ALL prospective patients. This is an information session about the procedures we offer, recovery and required appointments. 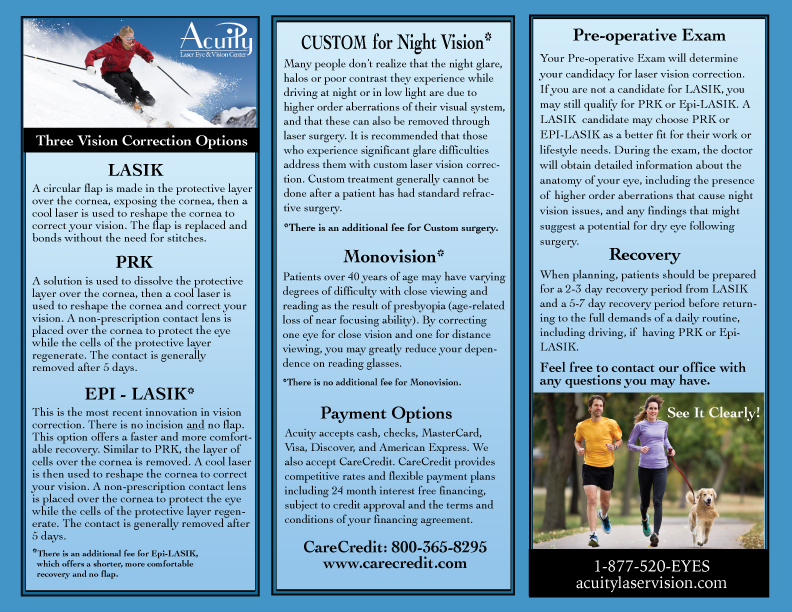 Any questions you may have about the overall experience of laser vision correction will be addressed. During this session, our patient counselor will use an auto-refractor to determine your prescription. Based on this reading, a price for LASIK or PRK surgery will be determined. Your price will be based on your prescription, including any astigmatism. However, you will not definitively know if you are a candidate for laser vision correction until you have a pre-operative exam. 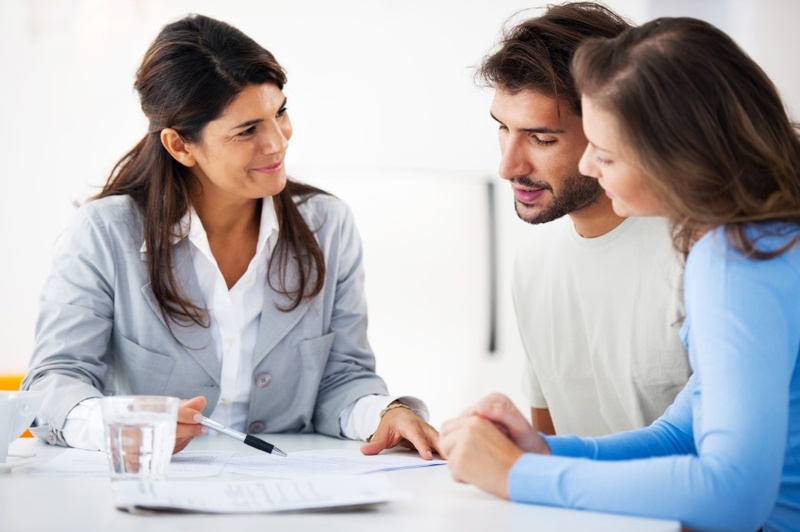 You may schedule your pre-operative exam and consultation together if you wish. Feel free to bring a friend or your spouse to your consultation! Contact Lens Wearers: Because laser vision correction involves the reshaping of the cornea, it’s imperative that potential patients refrain from wearing prescribed contact lenses for specific periods prior to surgery, depending on the type of lenses. Contact lenses change the shape of the cornea and your cornea must be in it’s natural shape to make a precise correction possible. 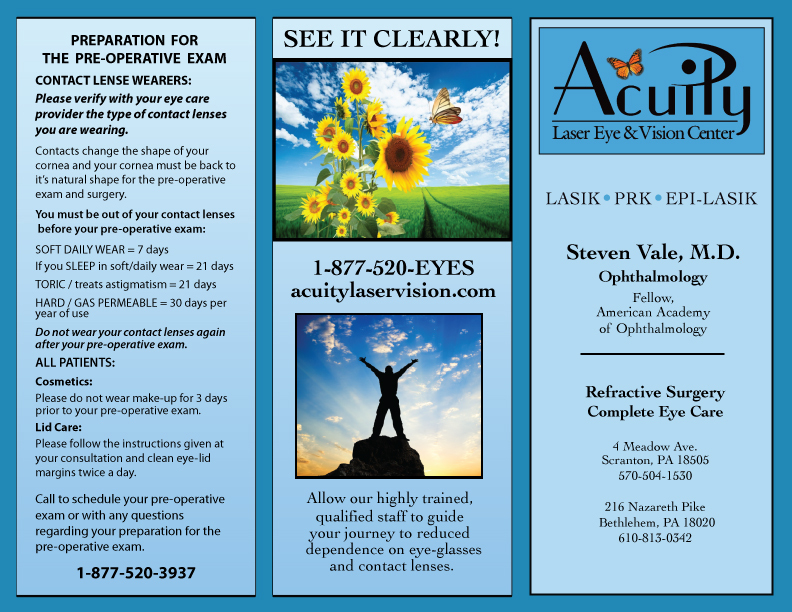 The recommended time periods to be out of your contact lenses are listed on the pamphlet below. TIP: Verify the type of contact lenses you wear with your optometrist or ophthalmologist and plan to stop wearing your contact lenses for the recommended time period before scheduling your pre-operative exam. Please be aware that laser vision correction is a reshaping of the cornea, and does not involve surgery inside the eye. The need for reading glasses or bifocals that occurs in most individuals around age 44 is believed to be the result of a weakening of the focusing muscle inside the eye. 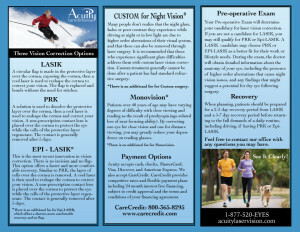 Laser vision correction can compensate greatly for this weakening but cannot stop the gradual weakening of the muscle. 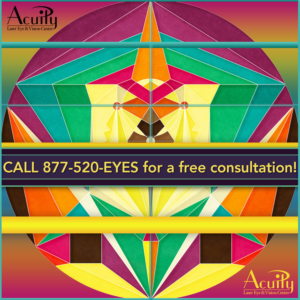 We recommend Monovision for those who would like to reduce their dependence on reading glasses, in addition to removing astigmatism and/or correcting farsightedness or nearsightedness. Monovision generally involves correcting the dominant eye for distance viewing and the non-dominant eye for close up viewing or reading. 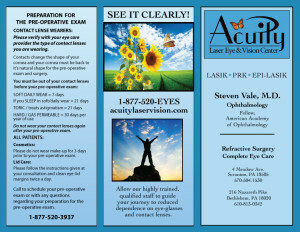 A “monovision trial” during your pre-operative exam, using trial lenses, can establish that monovision is right for you. Most people find they are quickly able to adapt to using their non-dominant eye for their close-up viewing/reading. Those with a monovision correction describe the shift between close and distant viewing as similar to the difference between how you see things in the periphery when your eyes are focused on an object or person. The brain selects the view that is desired between close up, mid-range or distant.